Life is good! The daffodils are blooming, boatyards are busy with skippers and crews getting their boats ready for launch, and the frostbiting season is over. And we all know what that means. Soon Manhasset Bay will be filled with boats, both sail and motor, waiting for their skippers. Yes, spring is always a very special time—a time to stop dreaming about that first regatta or fishing trip, and actual get out on the water. Three recent events helped to signal the end of winter sailing and the start of racing season. 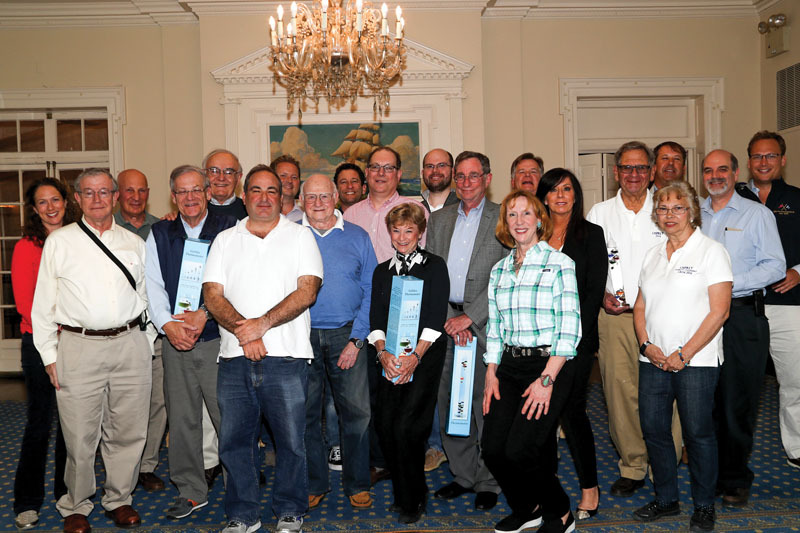 On Thursday, April 20, Commodore Anthony Viola, Commodore of the Cow Bay Cruising Association, aka Thirsty Thursday, called all teams to Manhasset Bay Yacht Club (MBYC) for their annual meeting. This year the meeting was extra special. 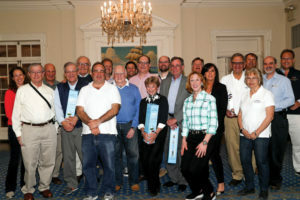 In addition to presenting awards to deserving skippers and crew, Dave Perry, the de facto authority on all things relating to racing rules, explained the changes to U.S. Sailing’s rules changes. 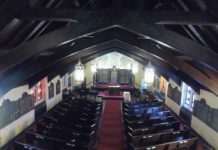 These changes occur every four years, so this was a very timely topic. Titled “Anarchy at the Mark,” Dave explained mark rounding rights and potential mishaps and included staring line conundrums that can cause problems. Over 75 local racers attended the presentation, with a few junior sailors who wowed everyone with their understanding of the racing rules. Many thanks to Dave Perry for donating his time to enlighten Thirsty Thursday team about racing rules. 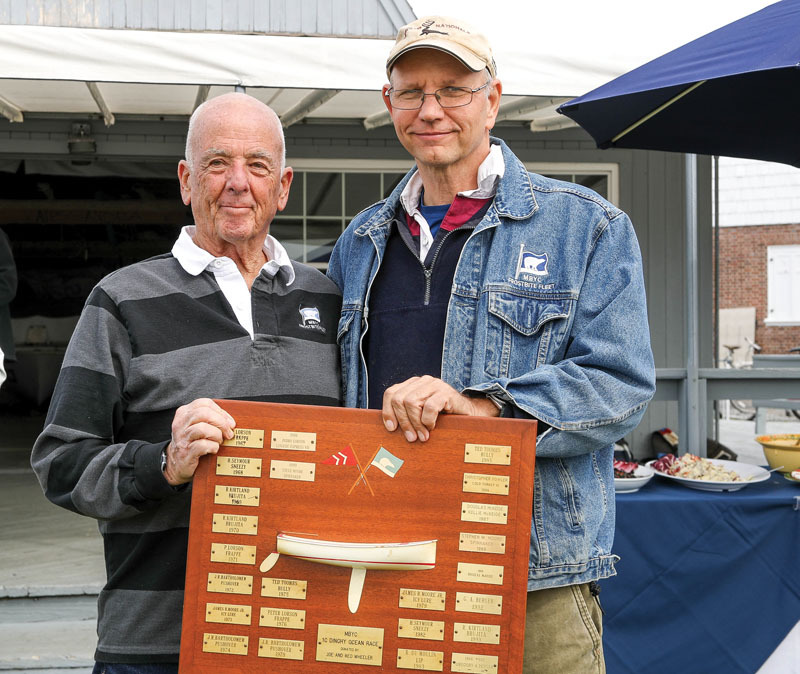 Anthony Viola, commodore of Thirsty Thursday, is seen here with Dave Perry, racing rules guru, and MBYC Commodore John Silbersack. The last day of Frostbiting is always the Long Distance Race, always held at Manhasset Bay YC (MBYC). This year the event was scheduled for Saturday, April 22, but the weather was not cooperative and the race was postponed until Sunday. While the sun was out and it was a beautiful day, the wind forgot to arrive. Sue Miller, Race Committee PRO, tried to find some wind and ended up shortening the course. But that didn’t even work. 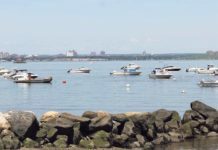 With only one boat crossing the finish line in the time allotted, the rest of the boats were towed back to MBYC, where a great BBQ was waiting for them. Every year the Long Distance Race celebrates the end of the season with this BBQ and awards ceremony, and watches as the Frostbiting burgee is lowered from the flagpole. Toward the end of the repast, MBYC Commodore, John Silbersack was on hand to award the Wheeler Trophy to Ted Toombs, a well-known local frostbite and Sonar sailor, for winning the inter-club dinghy division And while it is kind of sad to say goodbye to the close-knit teams who enjoy winter sailing, everyone is also happy to welcome the upcoming season. 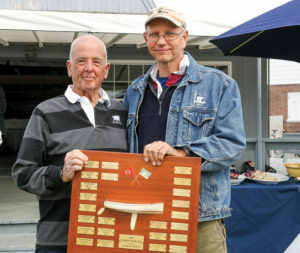 Ted Toombs (left) receiving the Frostbiting Wheeler Award from MBYC Commodore John Silbersack. The third event that signals the beginning of the racing season is American Yacht Club (AYC) in Rye, NY Spring Series. 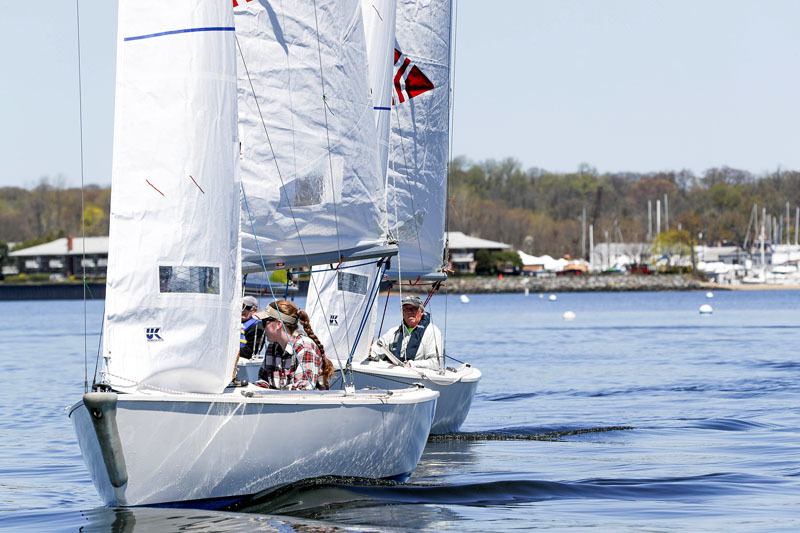 This heralded event is raced over two weekends at the end of April, beginning in May and is the first regatta on the Yacht Racing Association (YRALIS) Handicap Racing Program. This year the dates for “AYC Spring” are April 29-30 and May 6-7. Results after the first (only information available at deadline): Craig Albrecht, Avalanche, Port Washington Yacht Club, PHRF 1, first place; Paul Strauch, Andiamo, MBYC, PHRF 1, fifth place, and Oakcliff Sailing, Oyster Bay, PHRF 1, seventh place. 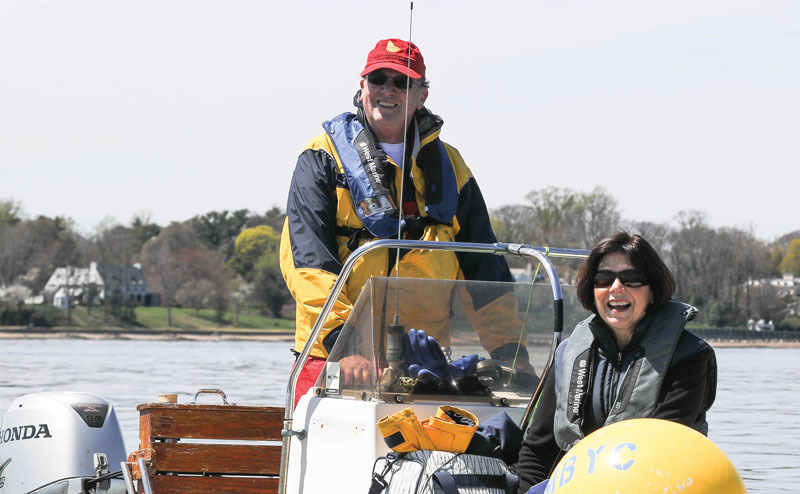 Bob Schwartz, Nordlys, MBYC came in seventh place in the J/109 division. And while this team is not local, it is included here because a team of junior sailors races the boat. The team is called the Young American Jr. Big Boat Team, race on Young American and placed third in the J/105 division. There is still another weekend of racing and these scores may change. But congratulations are in order to those who managed to get their boat and crew in shape for the first regatta of the season. For more information on this story, go to www.sailingpress.com. Andrea Watson is a Port Washington-based maritime photographer and journalist. 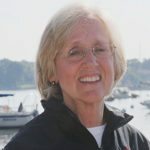 She writes Port Washington News' column On The Bay and is currently the Executive Secretary of the Yacht Racing Association of Long Island Sound (YRALIS). Letter: What’s Up With The New Movie Theater? Since 1908, Great Neck Record has served the communities of Great Neck, Great Neck Estates, Great Neck Plaza, Kensington, Kings Point, Lake Success, Russell Gardens, Saddle Rock, Thomaston and the unincorporated areas as a source for local news and community events.